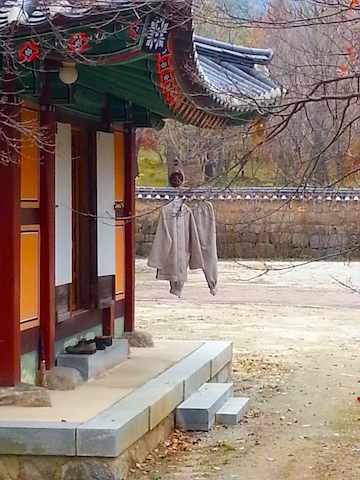 Looking through my Dropbox photo archive, I see that 2 years ago today, 22 November 2014, I was on an excursion with the Royal Asiatic Society - Korea Branch (RASKB) to Geumsan-sa, or Geumsan Temple. This Buddhist temple belongs to the Jogye Order, Korea's largest Buddhist denomination. It's located on the slopes of Mt. Moak near the town of Gimje in North Jeolla Province, which is in southwestern Korea near the Yellow Sea coast. It's an ancient temple dating from the late Baekje period (18 BCE-660 CE). 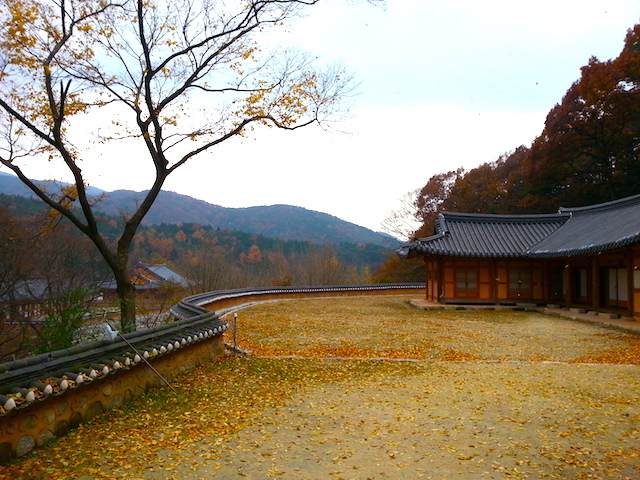 Reputedly, it was established by King Beop of Baekje in 599 or 600 CE. Reduced to ashes in the Imjin War of the 1590s, during which the Japanese tried and failed to conquer the Korean peninsula, the temple complex was rebuilt in the early seventeenth century. The three-storied roof makes this building a unique architectural treasure in Korea. Few buildings in earlier times had such roofs. In fact, few buildings in old Korea had more than one level. Its age also makes it special. Since Korean temple buildings were traditionally made of wood, many have been lost to fires over the centuries. 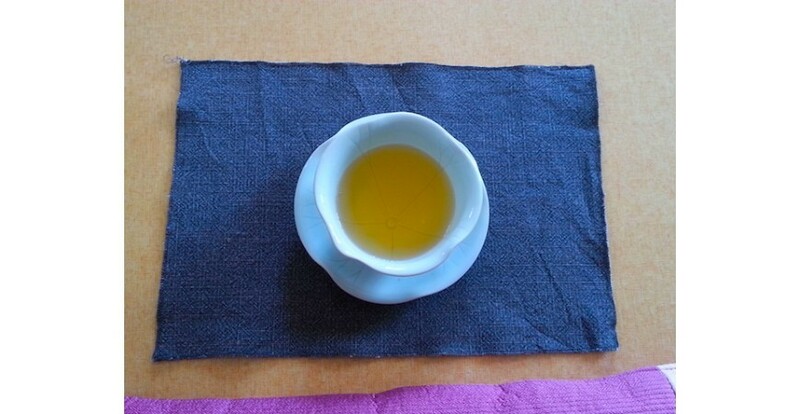 For these reasons and more, the Mireuk-jeon has been designated National Treasure #62. 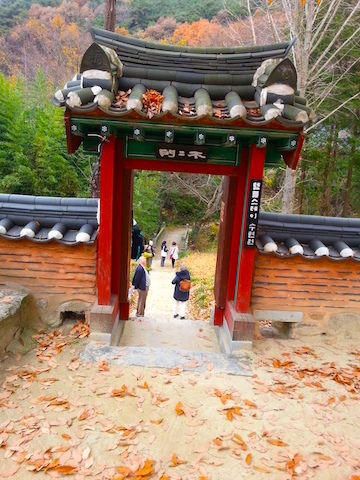 The gentleman you see beyond the gate on the left side of the path is excursion leader Brother Anthony of Taizé, also known by his Korean name, An Son Jae. A naturalized Korean citizen, Brother Anthony is the current president of the RASKB, not to mention a prolific translator and author. 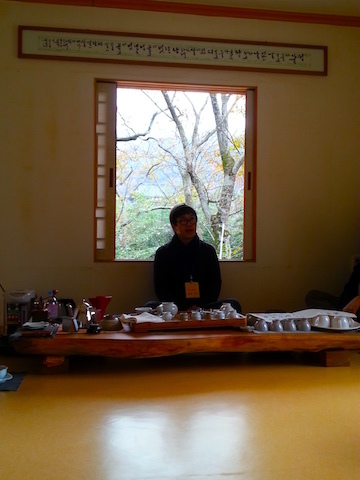 Among his publications are two books on Korea tea culture, The Korean Way of Tea and Korean Tea Classics. In other words, he was the ideal leader for this day's excursion. 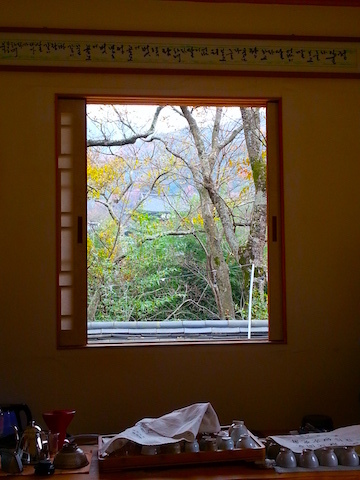 The cushions were rather more colourful than what you usually find in temple teahouses. It was delicious. 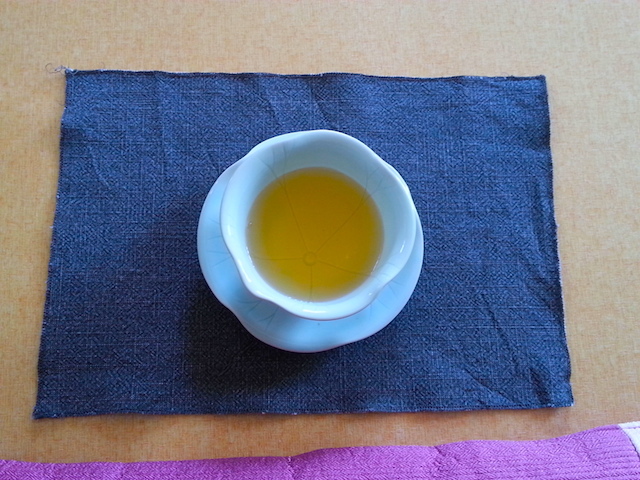 I'm still a bit in love with the tea ware. I believe it's patterned after the Rose of Sharon, which is Korea's national flower. I didn't ask, but I presume that the building at right is where temple stay visitors stay overnight. 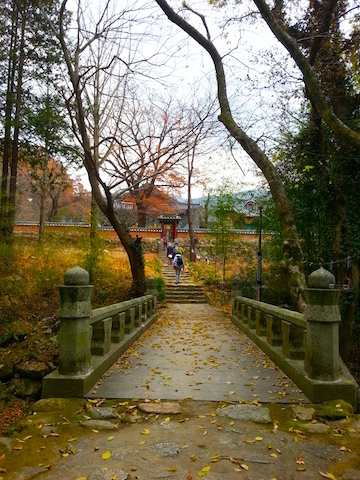 We were a bit unlucky with the weather, as you can see in the photos, but autumn is generally a lovely time of year to visit mountains and temples in Korea. 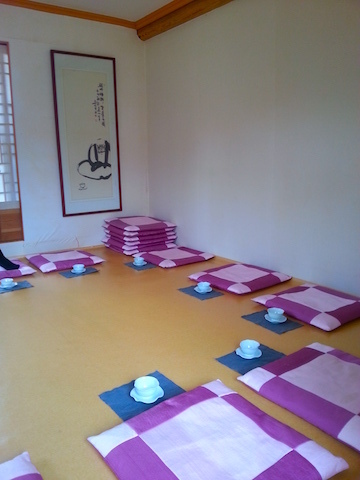 If you'd like to participate in the temple stay program at Geumsan-sa, you can find information on their English-language webpage: http://geumsansa.com/eng/ . If you'd like to go on an RASKB excursion -- and there are many available, almost every weekend for most of the year -- you can find out more here: http://www.raskb.com . You can order Brother Anthony's books about tea through the website, not to mention hundreds of other English-language titles to do with everything Korean. L&P profiles one of the most exquisite Angkorean temples. L&P spent some coin at the ROM shop. Read more to see the complete book haul. L&P reminisces about the Sacred Monkey Forest Sanctuary in Ubud, Bali. Part 1 of L&P's visit to the Bishop White Gallery of Chinese Temple Art at the ROM. L&P visits Wat Ek Phnom, an Angkorean temple near Battambang, Cambodia.